I've been sharing email with several customers discussing how the 'Active' ON OFF switch works. The idea behind this Active switch was, you might have coins in your collection that you no longer track, perhaps you sold these coins. 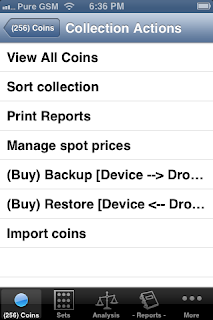 To reduce clutter in your Collection, you can open Coins that you've Sold and change their status to indicate you've sold them. Find coin, maybe use the Search. Touch Coin opens Coin in Edit mode. Touch Active toggle switch, changing ON to OFF. Save. Notice Inactive shows red lettering. 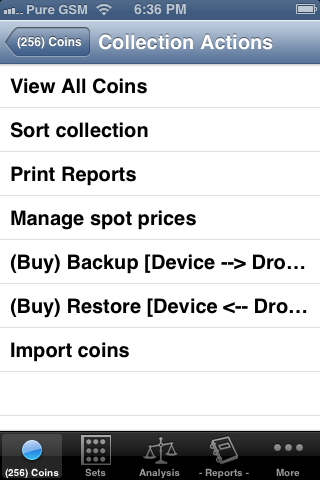 Select the Action menu on the Coins view, top right of screen. Leave a comment, let us know if this was helpful.